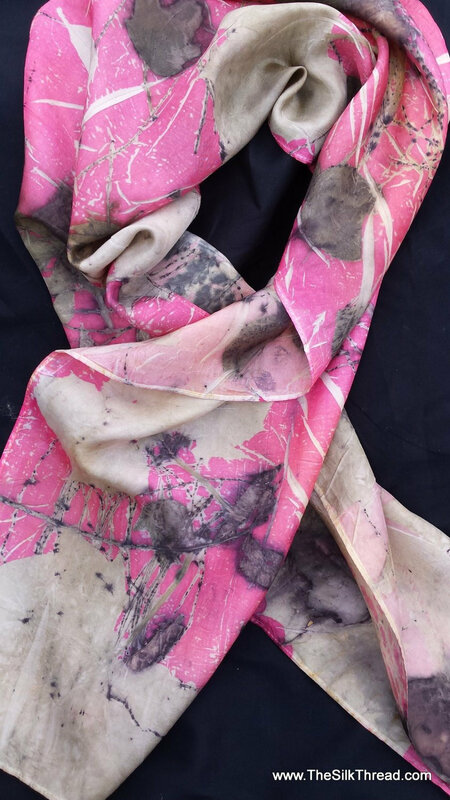 This gorgeous scarf is eco-printed on 8" x72" 100% silk using maples, sweet gum and rose leaves collected from my mini-farm. The fine lines come from long leaf pine surrounded by the beautiful bronze, whites and coppers you see in the image. The patterns were further enhanced with a cochineal bath which produces the stunning pink-rose tones in the silk. My all natural technique creates detailed shapes and colors of the actual plants. Every scarf comes with a tag with the story of its making. A unique and unusual gift! Colors can vary depending on your computer and your monitor may not pick up the soft shades and subtle prints in my ecoprinted silks. Eco dyeing or printing is the collecting and processing of Nature's leaves, plants, fruit and flowers to create the actual colors, designs and textured look of the plants on fiber. The results are beautiful, unpredictable and that is what makes it such an exciting and unique art form! Look closely to see if you can identify the plants used. You will often see not just a variety but both the positive and negative shapes of the leaves and flowers. (this is not "sun printing") The colors are the ACTUAL colors from the plants!Totally sustainable, renewable and recyclable art form. My silk studio is on my mini-farm and is set up for traditional and non-traditional dyeing. Everything hand done in my North Carolina studio! Each of my silk pieces and paintings are unique! Care: hand wash in cool water, drip dry, iron as needed.